Some chemicals such as ammonia and parafenilendiammina, used for the production of hair dyes can cause skin diseases and respiratory diseases. COLOR.IT has replaced the ammonia with Monoethanolamine and parafenilendiammina with Diaminotoluene sulfate (molecule of the new generation) thereby reducing the possibility of allergies and heartburn. It guarantees the utmost respect for the protection of the hair structure. 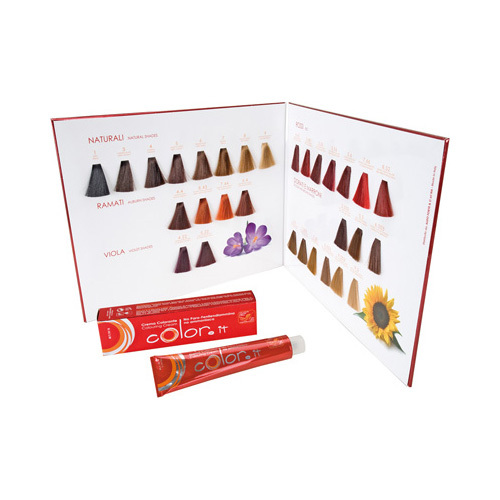 The exclusive use of active ingredients and pigments high quality, ensures consistent color and long-lasting, intense and brilliant tints and full coverage of gray hair. The combination of COLOURING CREAM and Emulsion Oxidant COLOR.IT in cream, allows to obtain a mixture and velvety soft, easy to apply and spread, for quick and easy. The ongoing research aims to create products that combine practicality, respect for the natural structure of the hair and excellent results, led to the formulation of coloring cream with COLOR.IT plant extract olive oil. Its light scent makes its use pleasant, ensuring a uniform color, bright and silky in total respect of the hair. - GOLDEN AND BROWN : 5.003.castano natural light chocolate, light golden 5.3.castano, 6.003.biondo natural dark brown, dark golden 6.3.biondo, 7.003.biondo natural tobacco, 7.33.biondo intense golden light 8.003.biondo natural almond, 9.003.biondo clear natural honey, golden 9.3.biondo clear. method of use : In a non-metallic container, mix one part cream and part and half of oxidizing emulsion cream. - The first application: evenly distribute the dye mixture prepared lengths and ends of the hair, leave on for about 10 minutes. Then re-prepare the same coloring mixture and spread it evenly on the roots also, subject to a further exposure time of 30 minutes. 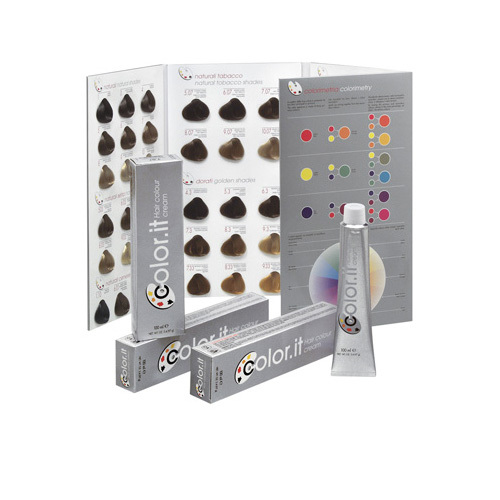 - Retouch : distribute the mixture evenly on the prepared dye hair growth, observing a shutter speed of 30 minutes. If necessary, for toning the lengths and tips a few minutes before the end of the exposure time moisten with a spray bottle and apply the color remained emulsifying everything. Always halve installation times after permanent or discolorations. After the exposure time, gently rinse the hair with warm water, a shampoo and a mask sour. Warning: coloring cream COLOR.IT is calibrated for a percentage of 70% of white hair. More than 70% using a darker tone (eg, to get a 7 use a 6). package : Tube of 100 gr.